Jay and Vijay were the guards at the gates of Maha Vishnu's Vaikunth. Once they prohibited duo child Rishis Sanat Kumaras from entereing the Vaikunth. The Rishis cursed Jai and Vijay to become Rakshas (demons) on Earth. 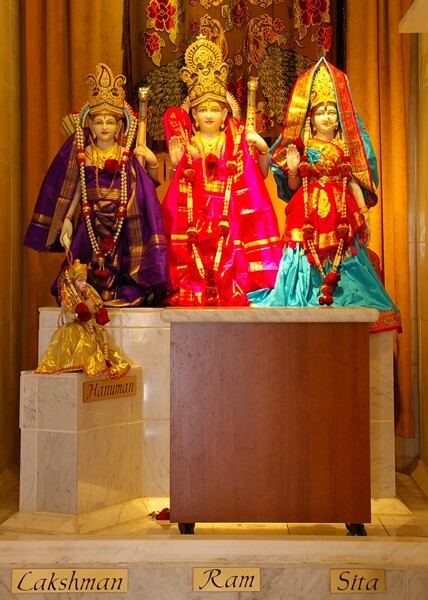 Jay and Vijay begged forgiveness, so the duo child rishis told them that after they are killed by Lord Vishnu three times, they will be free of birth and death as Rakshas and will return to their original form. In their second birth as Rakshas Jai, Vijay became Ravana and Kumbhakarna. They tortured people. They would regularly destroy ashrams and yagnasalas. They also caused lots of problems for the heavenly beings. Everyone started praying to Maha Vishnu to help save Earth by getting rid of the Rakshas. As always, Bhagwan Vishnu promised his devotees that he will help them by taking birth on Earth to protect the Dharma. Maha Vishnu, then, incarnated as Rama, Sheshnag (serpent on which Maha Vishnu lies in Vaikunth) as Lakshmana, Vishnu's Shankh (counch) as Bharata and his Chakra (discuss wheel) as Shatrughna. Hanuman was born from Lord Shiva's shakti. King Dasharatha was a noble king of Khosala state. He had 3 wives but no children. As a reult of Putra-Kameshti Yagna, Lord Rama was born to Mata Kaushaly, Lakshmana and Shatrughna to Mata Sumitra and Bharata to Mata Kaikeye. Rama learned archery from Saint Vishwamitra. Sage Vishwamitra along with Rama visited Mithila, whose king was Janaka - a great saint himself. Ancestors of Raja Janaka acquired Lord Shiva's bow. King Janak decided he would give his daughter Sita in marriage to the one who would be able to put a n arrow on SHiva's bow. Under the guidance of Sage Vishwamitra, Lord Rama broke Shiva's bow and married Sita. Later, in order to fulfill the promise of his Father, Dasharatha gave to his Queen Kaikeye, Rama went on exile for fourteen years with his wife Sita and brother Lakshmana. Rama moved from forest to forest, destroyed many rakshasas, and granted peace to Saints in the area. Ravan, the king of rakshasas, abducted Sita from Panchvati to take revenge from Rama. While searching for Sita, Rama met Hanuman. With Hanuman's help, he befriended Sugreeva, killed Vali, who was the king of Kishkindha, and replaced him with Sugreeva. With the help of Sugreeva, Rama attacked Lanka, the kingdom of Ravana, killed all the Rakshsa's commanders, then Kumbhakarna, and ultimately Ravana. This restored peace in the Universe. Rama coronoted Vibhishana as the King of Lanka and later returned to Koshala (Ayodhya). Sage Vashishtha coronoted Rama as the king of Koshala. During Rama's administration, his kingdom lived in ultimate happiness and complete harmony, famously known as Rama-Rajya (kingdom of Rama). When you please Lord Rama, all your hurdles are removed, you get wealth and happiness and attain freedom from all bondages. You can pray to Rama any time of the day by saying 'Om Shree Ram'.